A 2017 WAPA Rally first look at Dodge’s hot SUV. Check out the hood air intake and extractor vents on the SRT’s hood. High-end performance SUVs are nothing new. In the early 1990s, the GMC Typhoon lifted the fun quotient considerably by delivering a turbocharged 4.3-liter V6 engine, Garrett intercooler, BorgWarner transfer case, and a self-leveling rear suspension. It rivaled the performance of top sports car models of that era, including the Corvette. After the briefest of production runs, the Tycoon and the similar Chevrolet Blazer SS were canceled (see The Chevy Blazer is Back, But in Name Only?). Fast forward a decade and Porsche gave us the Cayenne, the first SUV from this benchmark-setting luxury sports car brand. If you hated the thought of Porsche adding an SUV, you might have been won over by this SUV’s prowess as it has proven to be almost as fast any Porsche sports car, while setting the bar for all performance SUVs. Red brake calipers are one of many performance touches on this Dodge. Dodge has its own answer to the Cayenne and that’s the 2018 Durango SRT. It is the latest take on Dodge’s midsize, three-row SUV and its most powerful model yet. We probably shouldn’t be all that surprised that there is a Durango SRT. After all, the platform-sharing Jeep Grand Cherokee traces its SRT history to 2006, with the current version rolling out six years later. What’s so significant about the Durango SRT is that it retains all of its top features, including room for six (captain’s chairs in the middle row instead of a bench seat), utility and towing capabilities — a whopping 8,700 pounds. What’s so special is what’s under the hood — a 6.4-liter HEMI V8 engine generating 475 horsepower and 470 pound-feet of torque paired with an 8-speed automatic transmission with paddle shifters. 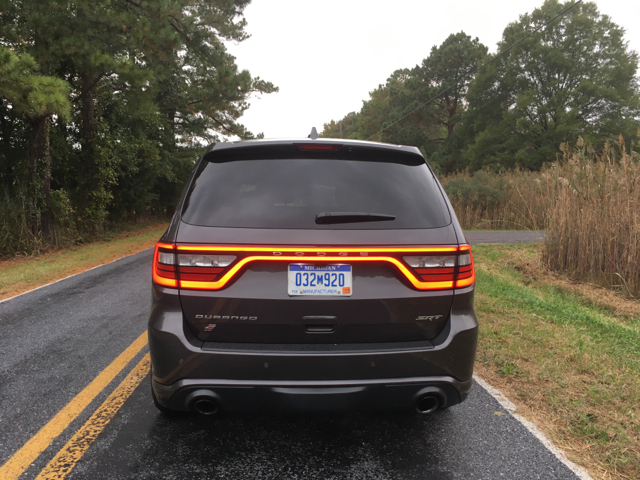 The good news is that Dodge estimates the Durango SRT can go from 0-60 mph in just 4.4 seconds. The bad news is that you’ll only get 13 mpg in the city and 19 mpg on the highway. Three rows of seats in every Durango SRT. Cost wise, you’ll need to prepare yourself to pay a $1,000 gas guzzler tax on top of the required premium grade gasoline for each fill up. Moreover, this all-wheel drive model retails for $64,090 (including destination charge) and that’s more than double the cost of the base model. 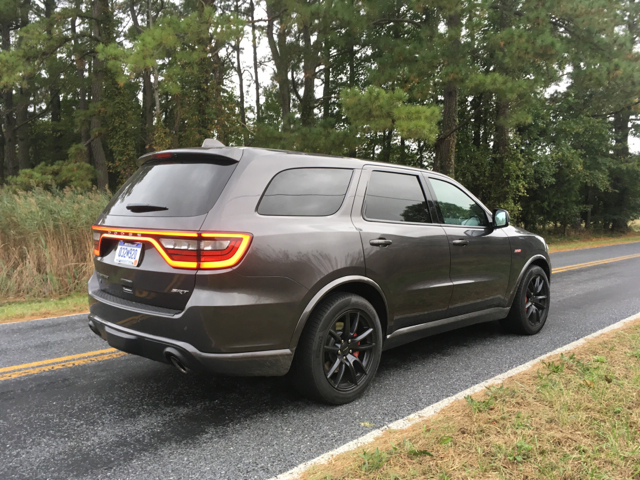 Cost aside, the Durango SRT is a hoot to drive. My driving partner (Arsis Fruritch) and I secured one at the 2017 WAPA Rally held on Kent Island, Maryland, earlier this month. It was one of the last vehicles we drove for the day, so we managed to get in a little extra time with it. Suffice to say, that the brief spin wasn’t nearly enough. Furthermore, with local police eager to hand out tickets, we had to take extra care not to draw excess attention to what we were doing. That said, we cast our concerns to the wind, finding a few remote spots on the island to open her up. She complied, by delivering raging potent power accompanied by a raucous exhaust note, immediately bringing me back to the day when a Jeep Grand Cherokee SRT came through my press fleet rotation. Like the Jeep, this one delivers a high-performance suspension with adaptive damping — the better to hang the corners with. Track lighting for this track-ready SRT SUV. 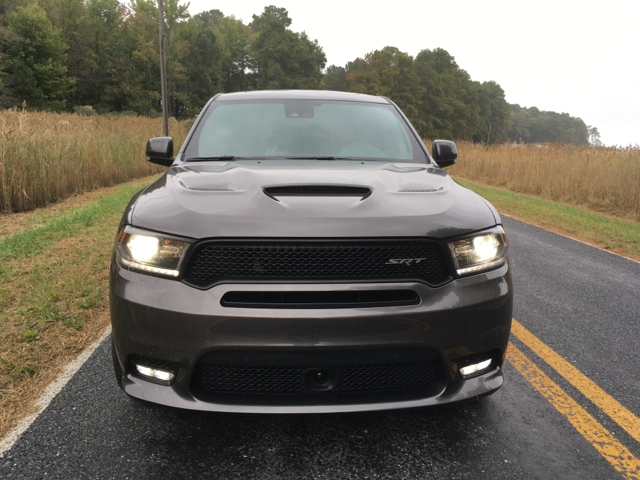 The funny thing about the Durango SRT, is that although it looks like a beast (and it is) with its beefy fender flares, hood intake and extractors, and other embellishments, it is still very much a functioning family vehicle. In the recent past, Dodge marketed its Grand Caravan as a “man van” and no one was fooled. On the other hand, in the Durango SRT, you have a vehicle that lives up to all the hype, one that’s certain to attract a niche following. Before we brought the Durango SRT back, we took note of some of its other features. The requisite red Brembo brake calipers were present. You also have your choice of seven drive modes at the ready — auto, sport, track, snow, tow, valet, and eco. Dodge didn’t skimp on interior materials either with leather seats and tri-zone climate control among the chief features. 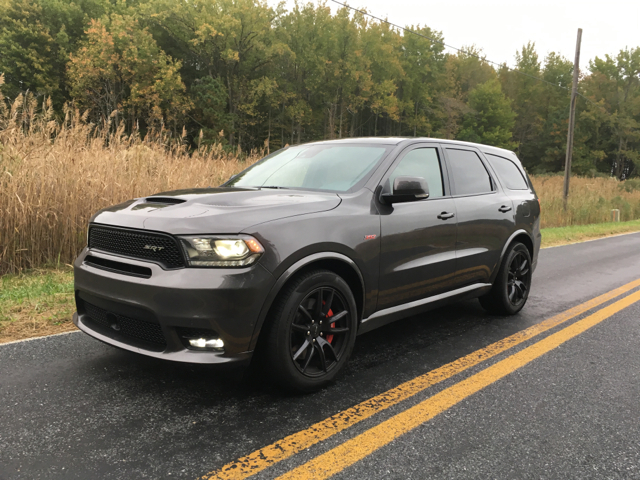 All in all, the Durango SRT may offer the best blend of passenger comfort, utility, towing and performance of any SUV out there, even outdistancing the Porsche Cayenne in at least two of the four departments. All this coming from SRT, FCA’s Street & Racing Technology division that’s also brought us Hellcat and Demon.